What is your Account information for? You Account information is used when you log into the system. It is used to identify what information is being stored in the system about you. Your "Known As" details and "Picture" are displayed to the Coaches/ Support Team and you can also set up your favourite forms here too. All of your Account information can be accessed by selecting the "account" button (shown in the image above). -Email Address: Your e-mail is the address that any reports, messages, or new passwords are sent to. Please make sure that it is correct at all times (must be entered into the system). -Date Of Birth: To change this type in your correct date of birth in the following format MM/DD/YYY. It must be written with a "/" separating the Month/Day/Year and then select press enter on your keyboard. You can use the << arrows to move between years and the < to move between months to select the correct date using the pop-up calendar. Move to the correct date and then right mouse click on the correct day. -Picture: An image of you that is displayed beside your Know as details. To replace the image with a different image select "Replace File", then select the "Browse" button to browse through the files on your computer once you have selected the correct image press the "Upload" button to upload the image into your account information. 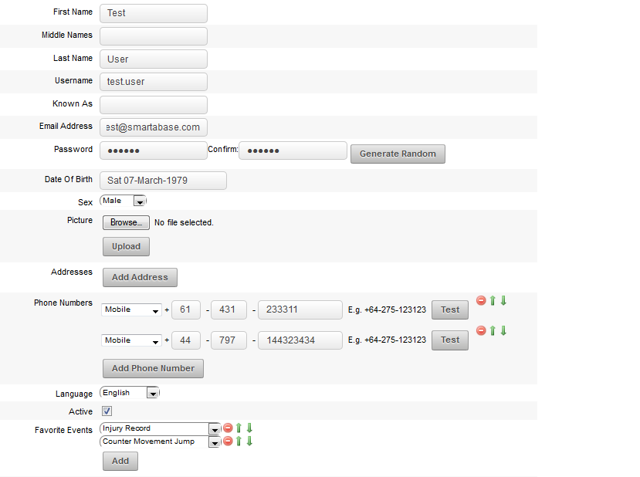 -Phone Number: Phone numbers are used for text messages. Phone numbers need to be entered as International, National (drop the 0) and then Local Number. For example, a New Zealand number (03) 453 2768 becomes 643 453 2768, or a New Zealand cell phone 0275663 877 becomes 642 756 63877. -Time Zone: Select the correct timezone depending on where you are in the world. Make any necessary changes and select "Save" to updated your account. -Please note that any changes you Save cannot be reversed, so if you change your password and then cannot remember it when you login next you will need to enter your e-mail in the "Forgotten Your Password" section of the Login page (see Section 1.0) and wait for a new password to be e-mailed through to you. When you received the Welcome e-mail you were provided with a Username and Password. Your password can be reset in the account page. To go to this page select the account button in the top right hand corner of the site. For security reasons your password is never displayed on the account page, but it can be reset here. Type in a new 6 character password in the "Password" and "Confirm" Box. If the two passwords that you have just entered are different an error message will appear (as shown in the image above). You MUST enter the same password in both text boxes and the error message will disappear and you will be able to save this password and use it the next time you login. Passwords need to be a minimum of 6 characters. You can change your password to something more meaningful, but please remember that for security try and use a mix of letters and numbers. NEVER use a simple 123456 or just your first name.